Speaking about the present economic crisis, author John Horvat II was the guest at the Berks County Tea Party meeting in Reading, Penn. on June 13. He spoke on the topic, “The Ten Steps to Prepare for America’s Economic Collapse” based on considerations from the book, Return to Order: From a Frenzied Economy to an Organic Christian Society—Where We’ve Been, How We Got Here, and Where We Need to Go. The speech was well received by those present. Mr. Horvat stressed the need to return to those institutions, conventions, and morals that prevent big government. Afterwards he signed books and conversed with new friends. Those interested in arranging a similar speech/signing can call (855) 861-8420. 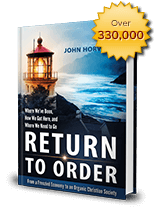 This entry was posted in Featured and tagged economist, frenetic intemperance, honor, Institutions, Praise for Return to Order, Products, public opinion by John Horvat II. Bookmark the permalink.